What is a Mirror dinghy? The Mirror is a small, light (i.e. hull less than 10lbs/foot), easy to sail, easy to transport, pram dinghy (pram means it has transoms at both bow and stern). It is the classic dinghy for training, cruising and racing. 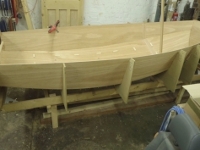 A stable family boat suitable for all ages and abilities, ideal for just "messing about", it is also raced widely and actively both in the UK and abroad. Its ease of handling makes it a very good single-hander sailed with main and jib. It also has a conventional (i.e. symmetric) spinnaker so all the skills needed on a three sail boat can be used. For racing the crew is two, but when pottering three can be carried. The boat can be rowed or fitted with a small outboard motor - it can then accommodate four or five people. Ideal for training young people, it used to be (sadly no longer) an RYA-recognised Junior Class. Many of the UK's top sailors started in a Mirror! A strict one-design, the Mirror became an International Class, administered by World Sailing (ex ISAF, ex IYRU), in 1990. These are the specifications for the Mirror. = 1390 (double handed, with spinnaker) & 1380 (single handed, no spinnaker) from the 2018 list. The 2009 list also had 1365 (single-handed, with spinnaker). At that time the double handed, with spinnaker PY was 1386, and single handed, no spinnaker was 1371. Rig = Bermudan or Gunter with optional spinnaker. 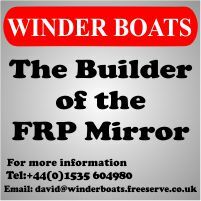 Want to provide feedback on your Mirror kit or new boat ? Spandex helps keep everything in place! Want to provide feedback on your Mirror kit or new boat? Contact UsAll content belongs to, and copyright © of, the UK Mirror Class Association. Design and Maintenance - Peter Sedgewick, Martin Egan.Thanks to Jan Grieg-Gran, Rob Grieg-Gran and Scotty Cochrane for their work on a previous website.